Mr O’Donovan’s annual survey of royal engagements | Who Runs Britain? The Times, letters page, 29 December 2017. 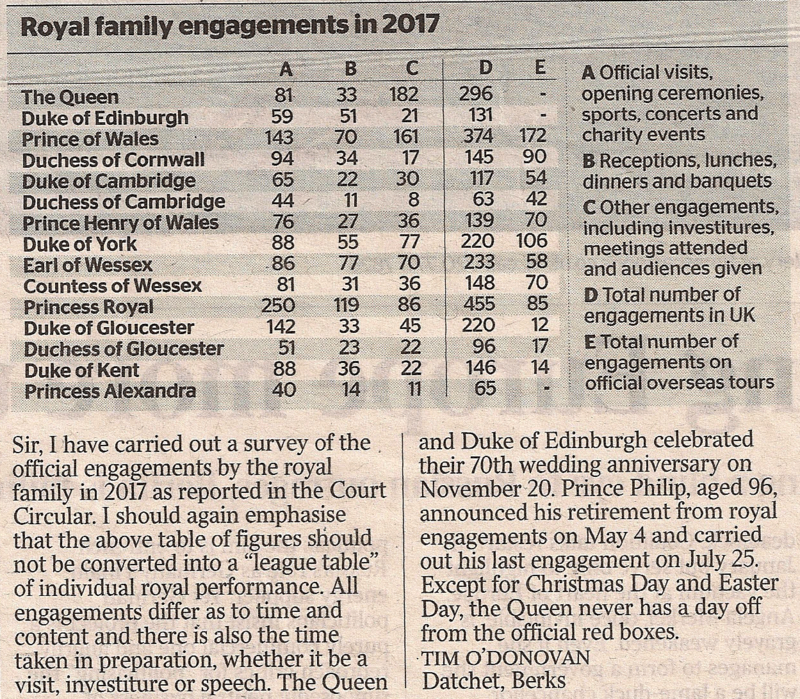 For the last 38 years a fixture of the festive season every bit as reliable as overcooked sprouts is the publication in The Times newspaper of a letter from Mr Tim O’Donovan, a retired insurance broker from Datchet in Berkshire, detailing the number of official engagements undertaken by the royal family in the preceding year. The survey is a labour of love by the self-confessed royalist which he first undertook in 1979. The source for Mr O’Donovan’s survey is the Court Circular, the daily record of royal engagements published six days a week in The Times, The Daily Telegraph and The Scotsman. There is no comparable official annual tally of royal engagements and Mr O’Donovan’s brief table and accompanying letter have become the standard reference work on the annual workload of the royal family. While Mr O’Donovan always insists that his survey should not be viewed as a ‘league table’ of royal performance, the publication of his survey is each year accompanied by a rash of media reports highlighting who has been the most (or least) hard-working) royal. One notable feature of the table in recent years has been the declining public role of the Queen and the Duke of Edinburgh, who are aged 91 and 96 respectively. For the second year in a row the Queen undertook no overseas engagements in 2017, and as Mr Donovan notes, the Duke of Edinburgh stepped down from public engagements in May 2017. Much of the burden of royal engagements has now fallen on the next generation of royals. In terms of the total number of engagements, Prince Charles, the Prince of Wales, was the hardest working royal in 2017, with a total of 546 engagements, closely followed by his sister the Princess Royal, who undertook 540 engagements, although she did carry out more engagements in the UK than her brother. It was the public role of Charles’s children, the Duke of Cambridge and Prince Harry, which attracted most media attention this year, in particular the fact that Prince Harry carried out more public engagements (209) than his brother William (171). Although it should be noted that the Queen carried out more public engagements than either William or Harry and in terms of public engagements in the UK, more than both grandsons combined. This entry was posted in Uncategorized and tagged monarchy. Bookmark the permalink.